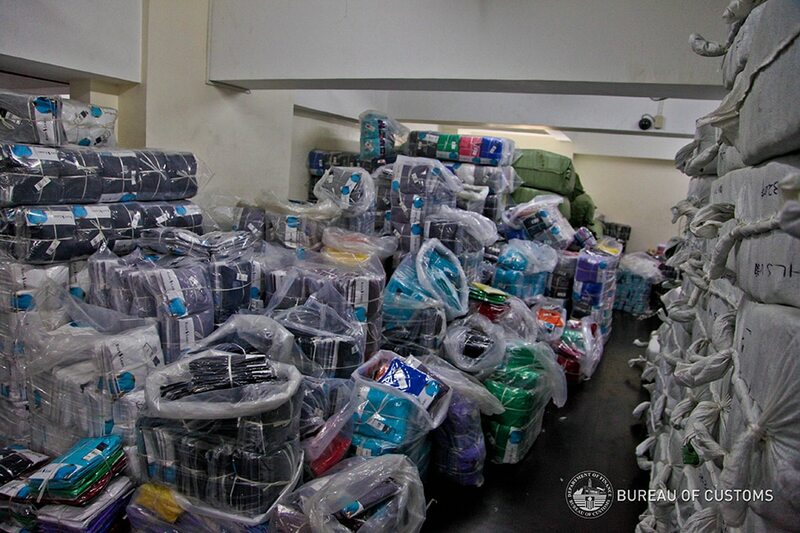 MANILA – Customs agents seized fake goods bearing several international brand names inside warehouses in Binondo, Manila and Parañaque City Thursday. In a statement, the Bureau of Customs said agents initiated the operation following a complaint from brand representatives of sports apparel giant Nike about the knock-offs. “This prompted our intelligence team to conduct an investigation on the subject warehouse units,” said Bureau of Customs Commissioner Rey Leonardo Guerrero. Agents found 2,500 sacks of fake apparel carrying well-known brands such as Nike, Adidas, Under Armour, Polo Ralph Lauren, Supreme, Roxy, Marvel, Hello Kitty, and Billabong, among others. The goods were estimated to be worth P700-million. Meanwhile, P150 million worth of fake items bearing brand names Nike, Adidas, Red Bull, Tsingtao, HP, Heineken, Oakley, Under Armour, Champion, Tribal, Bench, Peppa Pig, Disney Minions, Disney-Minnie Mouse, Cetaphil, Spiderman, Oneal, and Jaguar were seized from two warehouses in Steelhauz Compound on Meliton Espiritu Street, Sucat, Parañaque. The confiscated goods are now under customs control for safekeeping and will undergo seizure and forfeiture proceedings for violation of customs laws. Under the Republic Act No. 8293 or the Intellectual Property Code of the Philippines, fake goods are classified as prohibited.